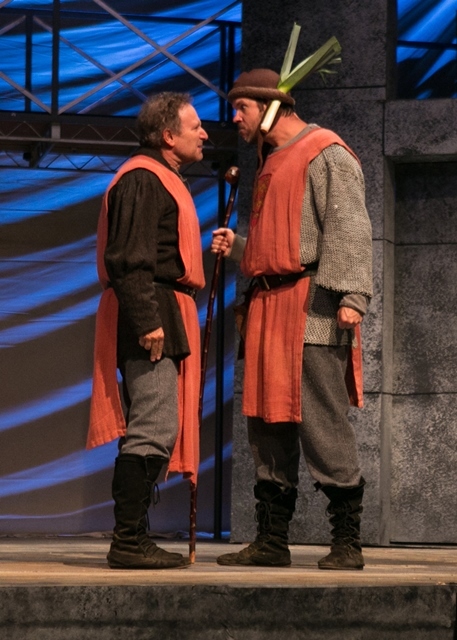 Kingsmen Shakespeare Company’s production of Henry V takes its cue from one of Shakespeare’s most well-known speeches, “O for a Muse of fire…,” the prologue to this play. In it, Shakespeare invites the audience to use its imagination in viewing what is about to transpire, to picture the battle scenes that will take place and the great kings who will lead their armies across the vast countryside, all represented on this humble stage. Director Michael J. Arndt follows through with this idea of sparking imagination by taking a minimalist approach to the production design leaving a wide open stage upon which fight choreographer Jason D. Rennie stages battle scenes using the largest number of actors to date in a Kingsmen production – some 35 in all. For the Battle of Agincourt, Rennie even incorporates the use of synchronized longbows which were vital to the English conquering the French, who greatly outnumbered them on the battlefield. The effect is quite stunning. In place of elaborate sets, scenic designer Erik D. Diaz uses metal scaffolding to create a second level and a pair of staircases to frame the playing area while large panels of billowing muslin form a living backdrop for Leigh Allen’s dramatically saturated lighting effects. Nothing is extraneous. Each visual decision reinforces this idea of using one’s mind to picture the real historical events. The result is a strong, sturdy foundation brilliantly effective in its simplicity and perfectly suited for this invention. Henry V is the final installment of a series of historical plays Shakespeare wrote known as the Henriad (Richard II, Henry IV, Part 1 & 2, and Henry V) which follows the making of a king. In the early plays, we see him as a wild youth cavorting with Falstaff and rest of the Eastcheap gang. But here he has grown into a young man who must throw off his earlier indiscretions and become worthy of the crown. Arndt knows exactly where he is going with this story and populates his production with a strong cast of principals, many of whom are veterans of previous Kingsmen shows. Leading the cast is Ty Mayberry (a former Hamlet) who makes a dashing Henry. With a confident stage presence and assured command of the text, he is believable as both a soldier rousing his men into battle and also a less-skilled romantic who must woo a future queen (Angela Gulner as the lovely Katherine who speaks no English). Arndt wrings much comedy out of this memorable courtship scene by again using the full width of the stage and inserting the French princess’s ladies between the pair each time he endeavors to get close to her. Other fine performances include Marc Silver as the headstrong Pistol; John C. Slade, doubling as Archbishop of Canterbury and the French King Charles; Jason D. Rennie as Henry’s uncle, the Duke of Exeter; and Michael Faulkner, hilarious as the Welshman, Fluellen. Guiding the audience through the story is Claire Kaplan who efficiently takes on the role of Chorus as a modern day newscaster for this production. In a bright orange dress and heels she walks among the proceedings commenting on what we’ve seen and what is to come, organizing the narrative to help us consider whether Henry’s decisions are right or questionable. The device works well within the production’s greater vision. What doesn’t ring true are the thick artificial accents of some of the supporting French character men who rely on stereotypical patterns that deflate rather than assist the humor in their scenes. And while Mayberry and those conditioned to project on an outdoor stage have no trouble being understood, the dialogue of less seasoned actors with weaker voices is difficult to hear. Resident composer Christopher Hoag has written a score that is largely electronic, drawing on influences like Vangelis and Tangerine Dream. The stylistic choice beautifully bridges the period story and modern narrative framework by creating a cinematic context where both can co-exist as one. Ominous underscoring, the swelling themes of battle, and the ethereal sound of the heavens surging in tandem with Henry’s victory all enhance the action without overpowering it. 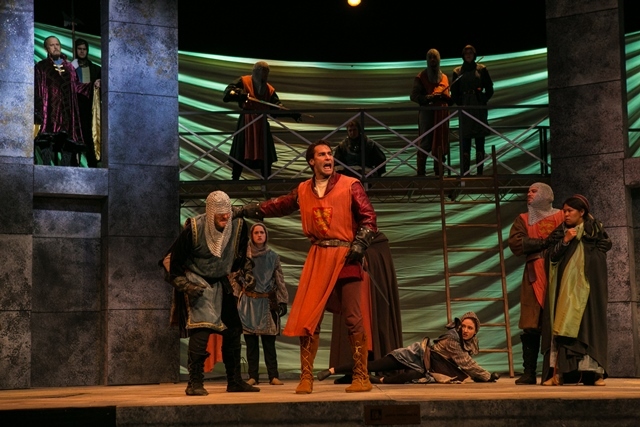 In the end, exciting stagecraft and an all-encompassing virtual reality of the mind come together to create a triumphant success for Kingsmen Shakespeare Company’s Henry V. The production runs one more weekend through July 10. This is a road trip worthy of taking. General admission tickets: $20 for adults and free for children under 18. Individual tickets are available at the door only. For lawn box reservations, visit kingsmenshakespeare.org or call 805-493-3014.